At the time of Mr. Letchworth's death, the Park consisted the one thousand acres of the original Glen Iris Estate. A century later, Letchworth State Park consists of over 14,000 acres. The acquisition of this additional land is an important part of the Letchworth story. The graph above illustrates the physical growth of the Park using 10 year increments. One that is a little misleading is the 1920s because that decade's land acquisition actually took place in the last four years. A table at the end of this glimpse breaks down the land acquisition by town. Land acquisition began in 1926 at a time when automobile travel and tourism was sweeping the country. Much of the acquired acreage was north of the original estate, expanding the Park beyond Wolf Creek. The Park of 1930 was about five times the size of the original gift. The decades of the 1930s was influenced by the availability of the Civilian Conservation Corp work force, the need to extend north for the planned Mount Morris Dam, and the desire to preserve the river scenery. The 1940s saw the expansion of the Park slow due to the war years and nationwide austerity. 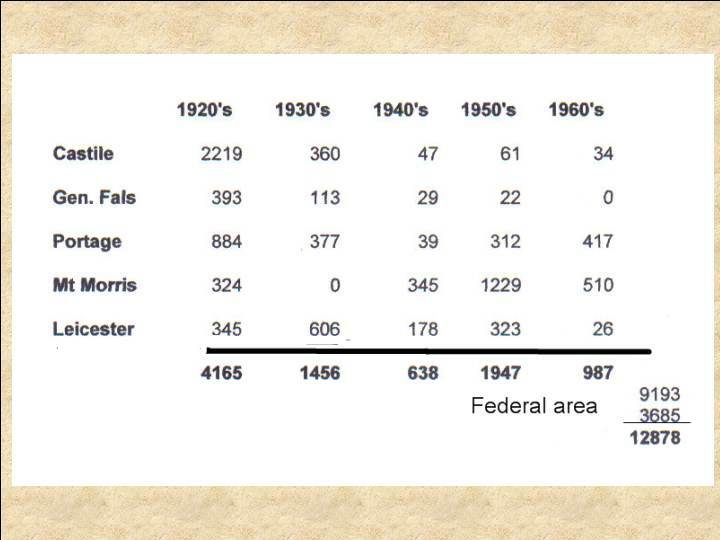 The 1960 Land Acquisition Bond Act, passed by the voters of New York, resulted in the last major increase of land. The funds made available by this bond issue allowed the State to fill in areas that were deemed necessary for proper park development. Some of this new Park land was at the north end near what is called the North, or Mount Morris Entrance. Much of the acquisition was along River road on the east side of the river. About 13% of this was the transfer to the Park by Rochester Gas & Electric Corporation of the right-of-way of the old Pennsylvania Railroad, successor to the Genesee Valley Canal. Now know as Trail 7 on the east side of the gorge and eastward tot he Canal Locks historic site close to Nunda. 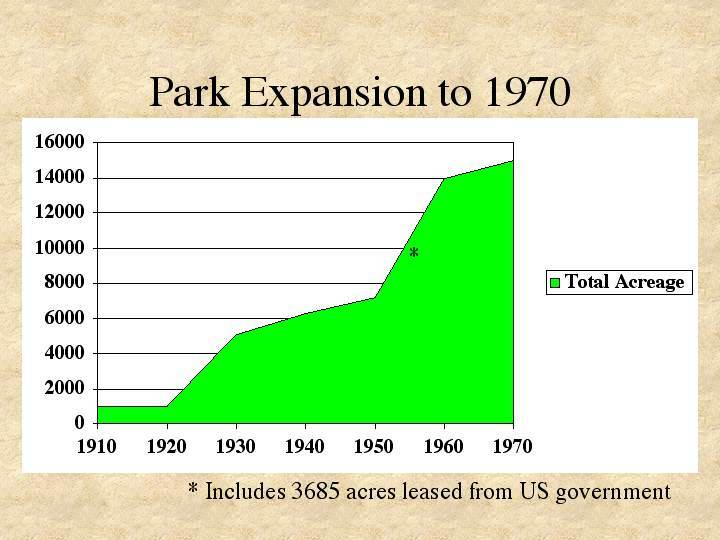 It should be noted that the 1960s also saw the last major growth in Park facilities. Those improvements that are most apparent to the visitor would include the High Banks Tent & Trailer Camping Area and the entire complex at the north end of the park. This includes the Gordon W. Harvey Swimming Pool, the three picnic pavilions, comfort stations and parking area. At one time a central building was a concession stand but that was diverted to office type use when it was unproductive as a concession. Growth since 1970s has been less that 100 acres. Facility development and improvement as been the thrust of management since then. This table breaks the land acquisition town by decade and town. Please note that the lease from the Federal government is not shown in the columns. The figures represent lands added to the original 1000 acres given by William Pryor Letchworth. Data for this story was provided by Letchworth State Park.